You simply brushed your teeth. Most common brand toothpastes contain a myriad of chemicals that are potentially dangerous to your long-term overall and wellbeing. The chief offender amongst them is still Crest Toothpaste. Mostly because it’s unnecessarily loaded with a plastic that has no hygienic purpose whatsoever. Crest’s distinctive blue flakes are actually made from polyethylene; the stuff plastic garbage cans are made of. And yes, polyethylene does not do anything besides giving the toothpaste shiny blue sprinkles. One cannot even hope that they’re mostly harmless because they will not even dissolve when dipped rubbing alcohol and acetone. Instead they’ll just sit in your gums and mouth. So far studies have not shown any direct illnesses caused by this plastic. However, it’s relatively safe to guess that no good can come of this. Although most commercial brands do not have polyethylene flakes, most of them are still not beneficial for your overall health. Unfortunately, ninety-five percent of common toothpaste brands are loaded with fluoride. Although it’s mostly championed for its dental hygiene capabilities (no, it does not whiten your teeth), it’s also really toxic. There’s a reason why your tube of Colgate has warning label regarding fluoride. These health risks include dental fluorosis (teeth discoloration), perioral dermatitis, and impairment in your glucose metabolism. It is also extremely worrying that if you accidentally ingest more than the recommended dose, you actually need to consult your health physician as soon as possible. So the question is why are you still using products that contain such a dangerous ingredient? And more importantly, how can you find a natural alternative to keep your smile healthy and happy? 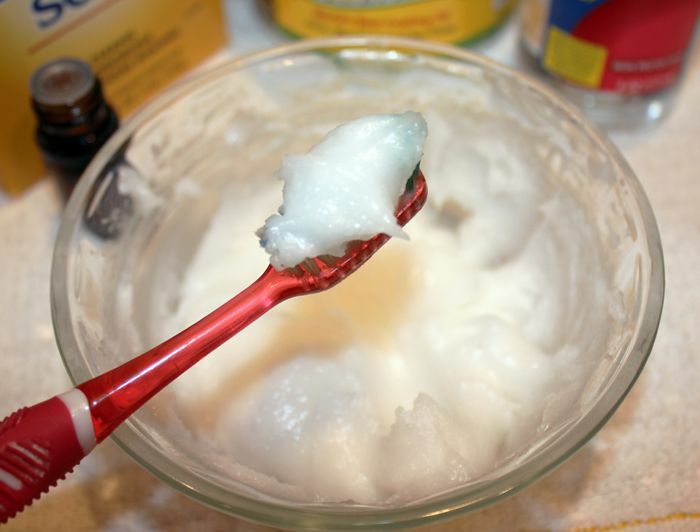 Don’t, worry, I found the perfect natural homemade toothpaste recipe. Additionally it’s also absolutely vegan! – Four tablespoons of baking soda. – Two teaspoons of coconut oil. – Eight tablespoons of water. – Five drops of peppermint, citrus, or clove oil. Excluding the oil of your choice, mix all your ingredients in a pot at low heat. Stir until it starts forming a consistent paste. Add the touch of oil only when you’re feel that about to finish. Place the paste in a glass jar and let it cool. Simply store at room temperature and you should be good to go. If this recipe does not sound like your cup of tea, I also recommend using plain coconut oil. It has amazing dental hygiene properties because it’s antifungal and antibacterial, helping protect the enamel your teeth’s enamel from the sugars you may have in your diet.